Awesome Screenshot is a quick and easy way for you and your students to annotate online images. Some of you may be curious as to how I am able to add arrows, text, circles, and speech bubbles to certain images whenever I post directions on this site. 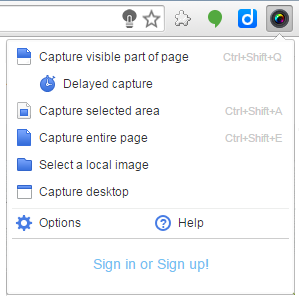 Awesome Screenshot is an extension for Google Chrome that allows you to take a screenshot of the visible part of a webpage, a selected area of a webpage, or an entire page (even the part of the page below the visible area). Once the screen shot is taken you can edit and annotate the screenshot without ever leaving the Chrome browser. Once the screen shot has been edited you have the option to save the file locally to your computer's hard drive or save it to the cloud via. a Google Drive or Diigo account. Awesome screenshot also offers a hosted app. This means you can use it offline. The app also offers a bit more in the area of editing capabilities. Oh and did I mention this extension & app are completely free?